TC Electronic has a huge line of quality effects. At the top of their list are the Flashback Delay and the Flashback X4. Two great pedals stemming from the same concept with a little twist on control, function and of course, size. Right now, both of these pedals have huge price reductions at Amazon. The Flashback X4 is currently on sale for $191.51 – with an MSRP of $369. 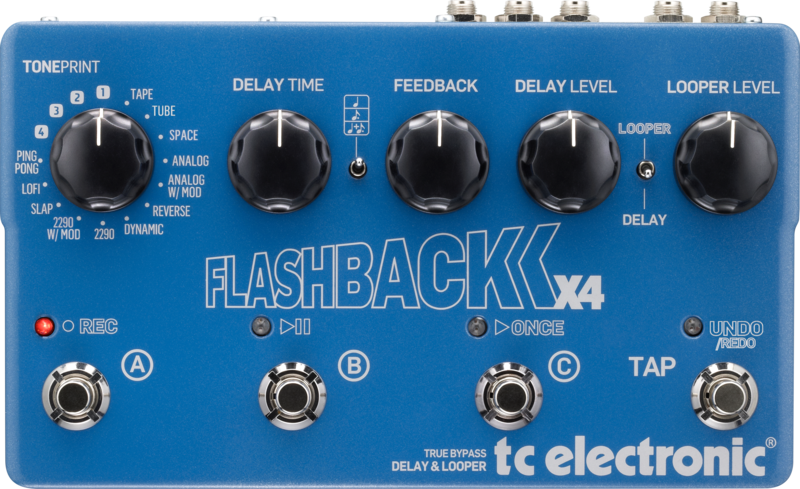 The more compact Flashback Delay is currently listing for $169 – the MSRP is just slightly lower than the x4 at $340. Both of these great pedals are nearly 50 percent off their regular price. It’s worth mentioning. If you haven’t heard too much about either of these pedals you can check out reviews at Pedal Finder. You can find the Flashback X4 reviews here. The Flashback Delay reviews you can find here. In general, both of these pedals are getting high marks, with comments like, “The tones are gorgeous, the range is deep, the versatility is massive. This is hands down the best delay you can buy. I use it every day.” More specifically, people are impressed with the versatility of the pedal, the presets, and the fact that it doesn’t color your tone like other delays out there. For what it’s worth, people really seem to like the Flashback Delay over the x4 due to the size. Which is something we all start to think about as our boards grow.